Now have fun challenging friends and family about their knowledge of St. Lawrence County with the new "Hometown Trivia" game, now available in local stores. "Hometown Trivia, the St. Lawrence County Bicentennial Edition" features 840 questions of knowledge and trivia about St. Lawrence County, its people, geography, history and much more! "Hometown Trivia" is great fun and educational for the whole family... and it makes a unique and great Christmas gift! Creator Bob LaRue has produced a collection of multiple-choice questions – some easy, some hard – featuring a broad selection of categories including history, headlines, sports, travel, music government, music and much more! 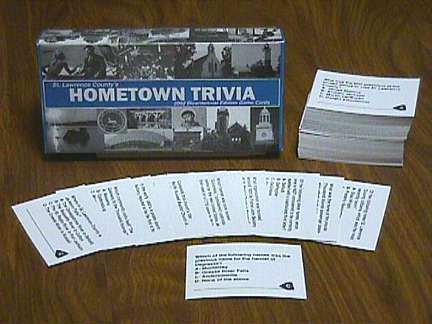 And "Hometown Trivia" questions can also be easily integrated as part of other popular trivia games. "Hometown Trivia" began as a companion program to LaRue’s popular 90-second local history vignettes, "St. Lawrence County Almanac" on WMSA 1340 Radio in Massena. For nearly three years since arriving at WMSA, LaRue has been the on-air "quizmaster," with daily questions of local knowledge and trivia. While stumping his radio colleagues, phone-in listeners have won dozens of prizes for their knowledge. "Hometown Trivia" is heard weekdays at 7:40 a.m. on WMSA.